Crafting Confessions: A Very Happy (and bright) Birthday! Love this little beauty Aimes! Really fab detail having the background muted and lined up perfectly to match your coloured focal point! Great colours too! Outside of your comfort zone, you allude too, but one fabulous card! This is going in the inspiration file Aimes!! Love the graphic lines and happy color. Such a super fun card!!!! Bright & happy!! Most excellent B-day card! Sorta reminds me of Heather's type of cards. Very, very nice! Hope the sun comes to shine this week for you. Hugs! Love you walk on the wild side, Aimes LOL! 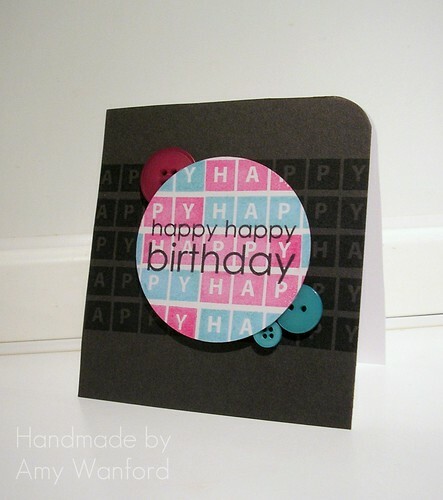 Darling card with bright colours. I love how you were able to line up the backgrounds perfectly!!! 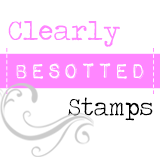 I like the bold colors and your button placement...I love doing this lately too! Lovely card Aimes. The placement is spot on and the buttons just add the perfect touch. Would love to see the photo of you dressed up! 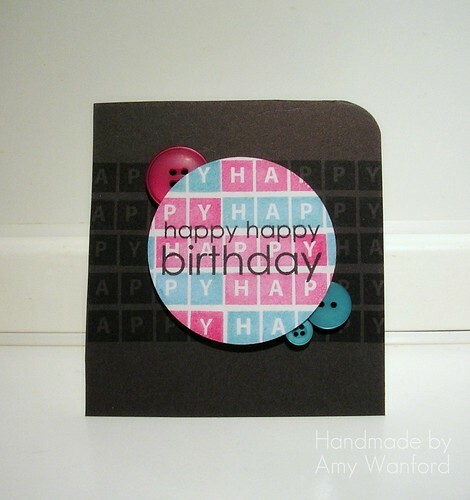 Very neat Amy - Love the way you have used square letters with circles and rounded corners so effortlessly! Clean and graphic, love it!!! And do you have a pic to share? Sounds like a super fun party. Aimes, this is FABULOUS! Love how you spotlighted the circle, it just POPS! Great card! Very cool! Love all the bright colors with the grey too! 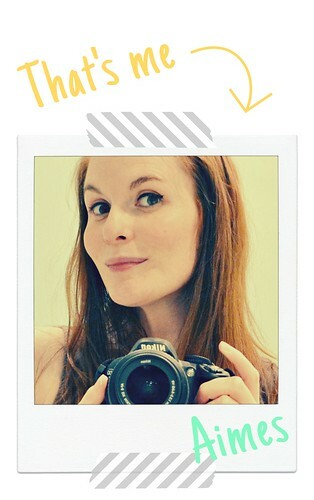 What a fantastic card, Miss Aimes! :) Love the bright colors against the dark card base. This is so neat! Love the color and the gray and the little squares with the big circle...and everything. LOVE this contrasty graphic style! Fantastic job matching everything so perfectly and the colors are wonderful! Super card, Aimes! The graphic details with the spotlight of color are fantastic! Oh I love the fun bright colors and the lining up with the bg! Fab fab fab! Very cool card! I love the bright spotlight of color against the dark background. Love the 'spotlight' effect, such an inspiration! OH how did I miss this one? so cute! I love the buttons tucked under the focal point! Going to have to try that one! TFS! Oh my goodness, I love this card SO much! The colors are uber fun, and I love the CAS design! Way to go, Aimes!